Groupon just did file for IPO which helps us to understand how well Groupon does, and unfortunately I see a lot of things which let me believe that Groupon will not exist anymore in 5 years. Groupon lost in 2010 $413 million and in the first quarter of this year $114 million. These are impressive numbers but of course not positive impressive. Therefore Groupon is talking about Adjusted CSOI (adjusted consolidated segment operating income). In accounting it is called non-GAAP (generally accepted accounting principles). In 2010 and the first quarter of 2011, Groupon said its Adjusted CSOI was $60.6 million and $81.6 million, respectively. Sounds much better, right? But we all remember as well that Groupon got $950 million investment in January 2011. In March Groupon had only $209 million in cash. Where did all the money go? The company’s IPO filing spells that out: most of the money went to previous investors and c-level employees. The details: Groupon raised a total of $946 million in two funding rounds last winter. It kept $136 million of it help run the money-losing company. The remaining $810 million was paid out, via stock purchases, to CEO Andrew Mason and some of his backers, including Eric Lefkofsky, and, notably, the Samwer brothers, who sold their CityDeal company to Groupon in 2010. 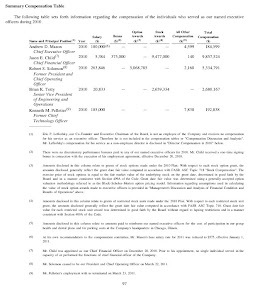 Looking at the filing we can see that Groupon made in 2010 $713 million revenue with a Gross profit of $280 million and did spend $263 million in Marketing. In the first three months of 2011 (not audited) they made a revenue of $644 million and did spend $208 million in marketing. This let us expect that Groupon will make $2.5 billion revenue in 2011 with $800 million spend in marketing and a lost of almost $500 million. The IPO is looking to get $750 million in. Which would be mostly gone for compensating the lost. Groupon is only three years old and did grow from $30 million in the second year to $713 million in the third year. This is a growth rate of over 2376%. However Groupon is making big lost each year, because of the aggressive marketing. The marketing helps Groupon to grow so fast and is much bigger than living social or other similar services. Not always the best system wins, but the system which spends the most money. One thing makes me sad with Groupon and is for me an early indicator that Groupons founders and c-level exit strategy is the IPO. I don't see any of them really interested to run Groupon as a company for 100 years. If you look at the lost the company made but the top level management got millions in stocks which is basically fine for the work they do for the company. But at the same time they got a lot of money from the $950 million in investment even, if the company lost a lot of money. Mr Lefkofsky made alone through the $950 million deal $320 million in cash. I would have expected that he would not take the cash and instead grows his shares and keep the cash in the company. Taking so much cash by knowing that the company is still losing almost a billion is not a good sign. If you look at his career, then you can see he is a person who invest in a company, help the company to get much more funding and then takes a lot of money out with no feelings how the company will do. The companies will eventual file for bankruptcy but he will be a billionaire. But we should not forget he is only 40 and has already brought two companies successful public and is net worth $800 million. And if I want invest money again, I would follow what he Mr. Lefkofsky is doing, I think he has a good feeling what is going on. A very smart guy. page 93ff is very interesting in terms of compensation. Lefkofsky began his career selling carpet at the University of Michigan. After law school, in 1993, he and a college friend, Brad Keywell, borrowed money from relatives to buy an apparel company in Madison, Wisconsin named Brandon Apparel. In 1999, Lefkofsky and Keywell created an early Internet company called Starbelly that specialized in promotional products. Starbelly experienced rapid “pre-bubble” Internet growth and was sold to Halo Industries in January, 2000. After Starbelly, Lefkofsky, along with a core team of investors and entrepreneurs, founded InnerWorkings in the fall of 2001. InnerWorkings provided print procurement services for mid-sized companies and achieved solid year-over-year growth. In August, 2006, InnerWorkings had a successful initial public offering in the U.S. stock market (nasdaq: INWK). 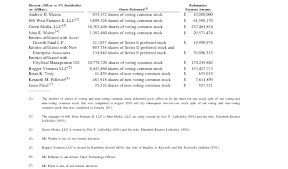 Lefkofsky is on the board of directors of InnerWorkings. In February 2005, Lefkofsky and Keywell created a freight logistics company called Echo Global Logistics. 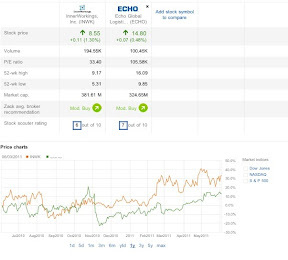 Echo attracted series D financing from New Enterprise Associates (NEA), one of the largest technology investors in the country, in June 2006. Echo Global Logistics went public on the NASDAQ under the symbol 'ECHO' and is now successfully being traded. In June 2006, Lefkofsky and Keywell founded MediaBank, a media-buying technology company. MediaBank provides advertising buyers with planning, buying, accounting and analysis software. In June, 2007, MediaBank acquired Datatech, one of the leading media planning and procurement platforms in the advertising industry. In July, 2007, New Enterprise Associates invested in MediaBank. In January 2007, Lefkofsky co-founded and provided $1,000,000 in funding for ThePoint.com, an online collective action website started by Andrew Mason. New Enterprise Associates lead an early stage investment round in ThePoint. In late 2008, The Point changed its name to Groupon.com. In October 2009, Groupon raised $30 million from Accel Partners and New Enterprise Associates. In April 2010, Digital Sky Technology and Battery Ventures invested $135 million in Groupon at a valuation of $1.35 billion. In August 2010, Forbes reported that Groupon is the fastest growing company in history. In February 2010, Lefkokfsky and Keywell announced a new venture firm called "lightbank" that plans to develop new companies in the Chicago area.